Taiwan, normally quiet in the tense six-way South China Sea sovereignty dispute, is likely to raise suspicion among the other claimants with a live-fire drill near the seaâs biggest natural island, observers say. The Taiwanese coast guard will conduct âroutineâ live-fire exercises November 21-23 around Taiping Island in the Spratly archipelago, a spokesman for the agency said Monday. Taiwanâs Ministry of National Defense declined to say whether naval units would participate. Because Taiwan normally says little in the broader South China Sea dispute â" it controls just two of about 500 tiny islets â" and has no formal diplomatic relations with the other five claimants, its activity may cause pushback as other disputants, including China, try to get along better, say analysts. âI donât know what is meant by routine here, but if it is some sort of military exercise, I donât think it is routine,â said Oh Ei Sun, who teaches international studies at Singapore Nanyang University. Brunei, Malaysia, the Philippines and Vietnam claim parts of the 3.5 million-square-kilometer sea that is prized for fisheries and undersea fuel reserves. China and Taiwan claim all of it. China also claims Taiwan, which has been self-ruled since the 1940s. FILE - Chinese dredging vessels are purportedly seen in the waters around Fiery Cross Reef in the disputed Spratly Islands in the South China Sea in this still image taken by a P-8A Poseidon surveillance aircraft, May 21, 2015. Beijing is currently working with southeast Asian governments on a code of conduct to head off any mishaps. Taiwan is not a party to the talks because China does not recognize it as a separate country. Vietnam's government denounced the live-fire drill plans last week as a âserious violationâ of Vietnamese sovereignty, the countryâs news website VnExpress International reported Friday, quoting a foreign ministry spokeswoman. Taiwan will use 40-millimeter grenade lau nchers and other weapons during a drill that will cover a radius of eight kilometers, VnExpress International reported. The coast guard spokesman declined to say which units will participate. Drills around Taiping Island âthreaten peace, stability, maritime safety and security, create tension and complicate the situation in the South China Sea,â the Vietnamese spokeswoman said. 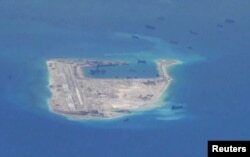 China or Vietnam might try to "dissuade" Taiwan from the drills by increasing their own presence near Taiping Island, Oh said. China occasionally flies military aircraft and passes ships near Taiwan itself, alarming the defense ministry. Taiwanâs government may hope to show that President Tsai Ing-wen is "committed to defending" South China Sea interests before m id-term local elections November 24, said Fabrizio Bozzato, a Taiwan Strategy Research Association fellow specialized in Asia and the Pacific. 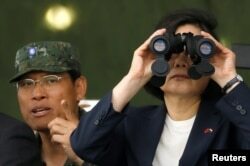 FILE - Taiwan's President Tsai Ing-wen looks through a pair of binoculars during anti-invasion drill, simulating the China's People's Liberation Army invading the island, in Taoyuan, Taiwan, Oct. 9, 2018. Drills in the South China Sea would insert Taiwan into a dispute that over the past two years has been shaped largely by China and the United States. China staged its largest ever military parade in the South China S ea in April. The United States does not claim the sea but periodically sends ships and B-52 bombers in support of its policy that the sea should be open to freedom of navigation. 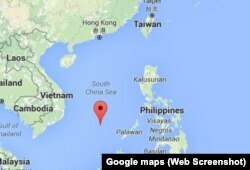 China has irked other countries by installing military infrastructure on some of the islets under its control. Washington sees Taiwan as part of a network of Asian democracies that hope to contain Chinaâs expansion and informal Taiwan-U.S. ties have improved under President Donald Trump. Beijing usually avoids challenging Taiwanâs South China Sea activities but has become increasingly testy toward Tsaiâs government over two-way issues. âThe exercises," Bozzatto said, "convey a message to the other claimants that Taipei is willing and ready to defend its territorial integrity." He said the exercises are also "a way to show to the United States and the other powers and to other countries upholding the principle of freedom of navigation in the South China Sea th at Taiwan is willing to do its part." In 2016, Taiwanâs coast guard and navy held search-and-rescue exercises near Taiping Island. A year earlier Taiwan had positioned itself as a humanitarian player in the maritime sovereignty dispute and urged all countries to share resources. FILE - A Taiwan Coast Guard ship, left, and cargo ship take part in a search-and-rescue exercise off of Taiping island in the South China Sea, Nov. 29, 2016. Taiwan Defense Ministry spokesman Chen Chung-chi said Monday the government sees Taiping as a âhumanitarian rescue centerâ but that any military participation in drills next month would be for âsec urityâ purposes. The island, 400 meters wide and 1,400 meters long, has a 10-bed hospital, an airstrip and a pier. Live-fire drills are useful given Taipingâs size, said Andrew Yang, secretary-general of the Chinese Council of Advanced Policy Studies think tank in Taiwan. He said they are also "routine" - as are protests from Vietnam.